NECESSITY: When the wind is howling, it finds its way under, down, and through you. A scarf simply crossed over at the neck makes a world of difference and when the thermometer goes below minus 10, a scarf at the neck is even more important. NICE: For me, make that a soft merino wool, cashmere or a wool/cashmere/silk blend. I can't explain to you honestly or scientifically that the natural yarn is warmer than acrylic but I do prefer the natural fibres. 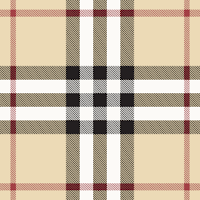 My favourite scarf is cashmere, basically a copy of the "Burberry check" which was developed in the 1920s and originally used as lining in the luxury brand's trench coats. I bought my scarf in Scotland at a shop selling cashmere items but it is not the official Burberry brand - a knock off I guess. 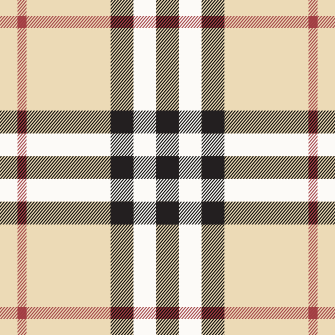 These two particular tartans, one from Canada, and the other from England are similar to the Burberry check. NO THANKS: My scarf needs to be lightweight, smooth and wrappable, not bulky. And so I say "no thanks" to a long thick bulky knit scarf but in fact, it all depends on the proportion of the bulk. So although quite beautiful, as this one posted on The Knatty Knitter, I prefer a less bulky yarn. I do love the colour and a pair of bulky knit mittens in that colour would be perfect with my Burberry look alike scarf. But that's the next post . 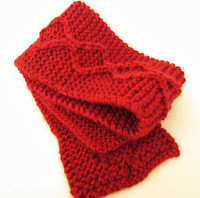 . .
NOTE-WORTHY: Although I say "no thanks" to a bulky knit scarf, I don't mind the bulky knit snood. It must be the wrapping process and what to do with the two ends of the scarf that add extra bulk that befuddle me. I am not one to wear a hat or tuque....vanity I guess....but I love to wear a scarf. No wind whistling down the back of my neck and I am warm as toast. But I am looking forward to it getting cold enough here for me to wear my new snood! It is not here yet, but we all know it is coming! I am looking forward to seeing the snood. Maybe you can take a photo with the newest addition to your family!